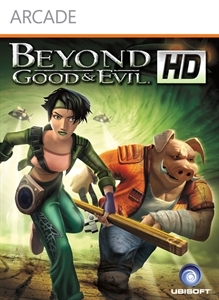 Beyond Good & Evil®, the award-winning action-adventure game from Ubisoft®, is back on Xbox LIVE® Arcade for the Xbox 360® video game and entertainment system from Microsoft, now with high-definition graphics. Play as Jade, a young investigative reporter, and expose a terrible government conspiracy. Wary of her government’s promises to repel the aliens for good, she sets out to capture the truth behind the prolonged war. Armed with a camera, a dai-jo staff, and fierce determination, it’s your job to save your planet and its inhabitants. Download this Premium Theme for Beyond Good & Evil HD to immerse your dashboard in the world of Hyllis. Just watch out for the Alpha Section elite force; they may be waiting for the right moment to strike. Luckily Jade and Pey’J will fend them off for you. Beyond Good & Evil - See if you can wear these green lips as well as our favorite girl Jade does. Next, how are you with orphans?? Beyond Good & Evil - Now you can hang out with Uncle Pey'J, too! Beyond Good & Evil - The protectors of Hyllis are equipped with the very best in military gear and armor. But what are they really hiding behind that scary mask? Beyond Good & Evil - It’s the Alpha Section duty to protect the citizens of Hyllis… now if they would just stop those darn DomZ….hmmm…. Beyond Good & Evil - The perfect sidekick outfit with heavy duty leather jacket, multi-purpose utility belt, and Peyj’s trademark fart-powered rocket boots.